“Why try? I’m tired of trying. “Why change? Nothing ever changes?” Many folks in early recovery believe NOTHING will ever get better or they believe things will get better, but only temporarily! They expect that when things are going well, something will happen and ruin everything…the bottom will fall out again and they will end up in the same position or worse. They have trouble believing recovery will make a real difference in their life. The truth, when we are living a recovery lifestyle things get better in our life. As recovery time increases, the big picture of our life begins to come together and many good things happen. At first, one or two good things happen. When we build on these improvements, several more good things happen…then several more…and several more. Soon, we go from experiencing relief to experiencing some life satisfaction. Over time, periods of joy occur…and meaning returns to our life! The truth, things get better when we get better. Things change when we change. When a Boulder Lands on Our Recovery Path: Things rock along okay for a while…3 months, 6 months, sometimes longer. We’re dealing with stuff that comes our way…and we’re making gains day by day…and then, something happens. Boom! It’s like a boulder falls out of the sky and smashes right into the middle of our recovery path. We’re now faced with a huge stumbling block…something big…and something hard to get around. The boulder that slams into our recovery path may be an old friend who shows up one day, maybe someone we’ve been in love with before. We’re feeling all the fun and excitement of the good ol’ times. We’re tempted to spend time with them to relive old times and cherished memories…however, their situation or lifestyle conflicts with our recovery plan. Maybe they still drink or use drugs, or cut, or shoplift…maybe they have a bad attitude or they don’t have steady work and want to stay with us for a while…maybe they’re moody and get very critical and ugly…maybe they’ve abused us before. The truth…life is going to happen. Difficult things will come our way and boulders will land on our recovery path. The direction our life goes depends on the choice we make when we’re faced with difficult situations. It’s like we come to a fork in the road. We can keep on the right path or we can go down the wrong road. No matter what we do, WE ALWAYS HAVE A CHOICE…to stay on the Recovery Path or to go down Relapse Road. At this point, we’re faced with a major decision…and we have two choices. We can fight to stay on the recovery path and work to deal with the situation productively, or we can relapse into old behaviors and habits to numb-out and white-out the pain and distress. If we choose to stay on the recovery path, we’ll probably have a tough time dealing with the situation. Getting around, through, and passed a boulder takes time and we’re impatient creatures…especially when we’re expected to tolerate discomfort, inconvenience, pain, and suffering without our preferred destructive coping behaviors! We don’t want to tolerate distress and it’s very tempting to give up…and give in to old ways…the ways of relapse. We don’t want to take the time it takes…to deal with the boulder. We want the pain and discomfort to go away…fast. We don’t want the stress. We don’t want the heartache. We just want to be happy. We want life to go smooth…and when it doesn’t, we get discouraged. We want to call it quits. If life has to be like this, we don’t want any part of it. The truth is…when we try…and continue to try to deal with life and all the boulders that come our way, life will get better and better. If we keep on keeping on, we’ll finally get through…passed…over…and around the boulders and obstacles in our recovery. That’s how people recover. They don’t give up…or they don’t give up for long! Recovery is not one action. It is not something that happens in a day. It is step-by-step, decision by decision, and day after day. It is a lifestyle…and a life-long endeavor! I responded today to a LinkedIn discussion started by Elisabeth Davies, MC of Bright Alternatives, Inc. and the author of “Good Things, Emotional Healing Journal: Addiction.” The discussion topic was, “Is relapsing with unhealthy substances an attempt to get more peace of mind? Being so passionate about this recovery topic, here’s my long-winded response! “For many, yes. 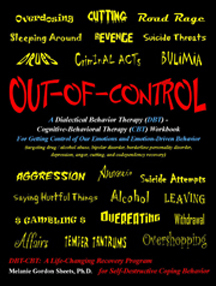 Many use substances as a coping behavior to help bring their emotional level to a more tolerable or comfortable level. Also, returning to such a behavior reduces the extreme tension of wanting to do it and not allowing ourselves to…thus, the experience of immediate relief or peace in-the-moment. To help us to feel better about relapsing, we’ve probably come up with all types of reasons (emotion-driven lies) as to why it is okay to do and would help us…and how we can also quit again when life settles down, etc…unless of course, it is a major emotional reflex to an immediate stressor and we do it VERY impulsively…without giving it much thought. Relapsing on substances is little different than wolfing down a big bag of cookies or scoops n’ scoops of ice cream, or starting to smoke again, a “forbidden” sexual encounter….whatever. I think these types of behaviors have to do with attempts to bring an “out-of-control” emotional mind into control…so that we feel better and more comfortable in the emotional moment. It is all about being desperate for relief and doing what brings us relief, often immediate relief. It’s a desperate way to experience a sense of emotional, psychological, and physical peace IN-THE-MOMENT…although we’ll have hell to pay when we come to (when the emotional moment passes and rational mind picks up strength). When we come to and realize what just happened and are faced with the consequences of our behavior…and the unresolved problem…we feel bad again…and then we may continue destructive coping….chasing “peace in the moment”…When we use destructive coping behaviors to deal with our pain and problems, we enter the Cycle of Suffering. Our problems multiply and intensity and we go through a period of increased pain and suffering as a result. I believe most people use destructive coping behaviors to some degree (e.g., overworking, oversleeping, physical aggression, yelling, throwing fits, being rude and ugly, ‘always speaking our mind”, lying, gambling, obsessive exercise, cheating, sleeping around, codependency, procrastination, smoking, prescription meds, alcohol, overeating or eating the desired “poison foods” for us, being hyperreligious, narcissistic….and the list goes on and on.) I actually tell my patients that it’s “normal” to be “abnormal” and entirely abnormal to be so perfectly normal and in control of ourselves. We all do some destructive coping behaviors and the healthier or more in recovery we are…the less we do these things…and the more we work VERY hard to stay in control of our emotions, behaviors, and our addictions of choice….and the more we choose life-enhancing coping behaviors instead. I’m obviously very passionate about this…it’s one of those, “been there, done that, still doing that…having to fight for recovery at times to stay in control…and not to get too far out of control” type of things for me. I believe that when we are in recovery…we remain “works in progress.” Sometimes it’s a daily battle and sometimes, an occasional battle. We’re emotional critters and creatures of habit…and when we hurt or are feeling desperate and “out-of-control”…we tend to fall back into old patterns of relief-seeking behaviors…or to certainly think about doing them! And you know the more we think about doing them…the more likely we are to finally do them. That’s because the tension is building…we want…and we won’t allow ourselves to have…and we want…we tell ourselves “NO”…and we want…and we’re tired of the pain, problems, tension, and frustration…and we become desperate for relief and peace…that we finally do what we keep trying not to do…and we relapse. Have you “been there, done that?” Have you been through this struggle? It’s a battle of the minds, Emotional Mind vs. Rational Mind and Wise Mind. It’s a battle of wills…willingness vs. willfulness. Which recovery skills do you use to get through the “fixing to relapse” moment? Do you still have these moments? I believe that one of our major recovery tasks is to learn ways to keep our Emotional Mind in control and to tame our Emotional Mind when it is getting out-of-control. That’s my biggest recovery task…and it’s always a battle of the mind states and a battle of will. Sometimes, I grow tired of the battle and dealing with my emotional, willful self. At those tired, weak moments, I remind myself….”Mel, what do you want…peace and stability or chaos and pain?” Isn’t it horrible that you have to parent yourself even when you’re a grown-up!? Can You Lose Weight By Diet Alone…Or Do You Have To Exercise? I have LOST 150 POUNDS WITHOUT EXERCISING! I’ve lost weight slowly over the past four years. I lost about 5 pounds a month for the first year…about 3 pounds a month for the next two years…and now I’m losing 0-2 pounds a month. I’ve lost about 13 pounds during the last 12 months. My ideal body weight is in the range of 105 to 135 and I’m averaging about 125 now. It’s harder to lose weight now and it takes a whole lotta Mindfulness and determination to maintain my weight and to lose any weight. I was modestly active most of my life, but the last 15 years has been high work, two kids, and little else…and mostly desk time. When I was planning how I would diet, I did not want to add exercise to my lifestyle because I realized it was VERY unlikely that I would maintain that lifestyle for any length of time. I felt it was a set up for failure…start slipping with exercise…start feeling bad about myself…and here I go…relapse fixin’ to happen! I chose to focus on diet alone and obviously this has worked very well for me. I knew how to do “diet” because to maintain normal body weight for the first 30 years of my life, I had to keep calories low…so, I already had those skills. So, I chose to focus on what I would have the highest likelihood of success with…and avoided anything I felt could increase the likelihood of failure. I sat down and completed a DBT-CBT Therapy Workbook “Game Plan” for weight loss. I included every diet tip I could think of and I reflected on how I used to do things when my weight was low. I decided I would drink a lot of water, not starve myself, eat breakfast to get my metabolism going for the day, eat what I was REALLY craving…and work to balance things out, count calories, eat something before leaving work so I wouldn’t arrive home starving to death, avoid food fests, avoid temptation, do the chocolate binge and get rid of the leftovers…etc. Overall, the first four years of the diet were fairly easy, but now I’m struggling. I smoked for the last 18 months through June 2009 – recently quit…and it’s been harder to keep calories low. Weight is still good, but the struggle is certainly there. It’s not easy anymore! I was always aware that as I got my weight down, I’d probably begin to exercise so I would look better…well, I think it is time to exercise so I’ll look better, but the biggest impetus is to be able to eat about 100 calories more per day! I’ve STARTED to exercise twice during the last year…but haven’t maintained it for more than a week at a time! Once I got that shoulder blade muscle cramping thing…the one with horrible pain that just doesn’t go away…and you can’t even breathe or move for awhile. The last time, I started to get sick…was exhausted…and didn’t want to stress my body! I am going to try to do a little at a time…not get so excited and ambitious and increase the amount or intensity so fast…just going to try to have some balance! Me, balance….ha! But, I’m going to try so I don’t sabotage myself AGAIN!!!!! I’ve gone through a very hard time in recent months with my “diet”…or better said, “my eating plan.” My positive eating patterns had become a habit and little emotional energy was invested in the process. I had peace and stability in this area of life. People would ask, “Isn’t it hard to stay on a diet?” No, it really wasn’t because I HAD developed good eating habits…and eating in this manner was natural for me. It was more of a lifestyle than a diet. But, SOMETHING HAPPENED and these past few months became the most trying time during my four year diet. Not sure what happened, but somehow things got Out-of-Control. I struggled through…and regained fairly good control. Naturally, I’ve been reflecting on WHAT HAPPENED…because I don’t want to let this lifestyle slip through my fingers and for things to get out of hand! I don’t want to get fat again…I don’t want to start the weight gain cycle…AGAIN. Here’s some things I have thought about. I FINALLY quit smoking in June after 6 attempts this year! Quitting smoking leads to increased eating because my hands and mouth aren’t busy…and reduced metabolism because I’m not loaded with nicotine…HELLO WEIGHT GAIN…and increased appetite! Another thing that has changed in the last couple of months is that I started taking a daily multivitamin. Now, I haven’t studied recently, but from what I remember, vitamins increase appetite. Not sure why that happens…or if that’s really true. Just some tidbit of information I picked up and think is true. Another thing…I began living on fruit…fruit was my mainstay…the largest source of calories per day. I loved the fruit diet! However, something was going on and I was craving sweets more…like CHOCOLATE! I was eating the Snickers protein bars…Mmmmm good…however, they are 290 calories each. When I seek to keep calories below 1300 or so a day…that adds up F-A-S-T!!!! So, I’ve stopped eating fruit…and this has led to a major decrease in the sweet munchies. I’m thinking the sugar in the fruit did something to increase my appetite for SUGAR! In my four years of dieting, I would chocolate binge about once every 4-6 weeks…and while on the fruit diet, the craving for CHOCOLATE was STRONG…and something I gave in to. I believe in “have a craving…satiate it and go on with life.” That has worked very well for me…because I’d eat 800 calories of chocolate…eat less dinner or no dinner…and suffer little net gain in calories that day…and little effect on the monthly average…and little effect on my weight…until recent months! Another thing that happened in July…is that an overwhelming workload greatly increased…and the type of stress changed…from internal pressure to get the job done…to external pressure…like performance counseling…and a 30-day deadline! I expect the extra stress and the type of distress affected me, too. Anyways, lots of changes…radical physiological and psycho-emotional changes (nicotine withdrawal and loss, diet change with increased fructose and then refined sugar…and EMOTIONAL STRESS from work…and stress from my daily diet spiraling out of control! You know, I’m sure there are other factors too…that I’m not currently aware of…but, those are the biggest ones on my mind right now!!!! You know…I may have gotten cocky too…had my weight down real good…had this diet thing “down to a science”…and then…slacked off a bit! Anyways, things have gone fairly well the last 3-4 weeks…actually regained some semblance of peace and stability in my eating. Revisited the 124-125 range…the size 7’s fit again…(size 9 slim fits are sized like a 7!). Went out of town a few days…and did alright. Not a major pig out…ate some restaurant food, but did well with that. Got favorite foods and ate about half. Some extra calories…but nothing Out-of-Control! Back to work tomorrow, will tighten up again…and go on with life. Average calories for October was in the normal range for me…similar to the last 4 years…so,, that’s good! The last couple of posts in October note what I did to try to get control, so I don’t want to restate EVERYTHING here…cuz I can’t remember and I’m too tired to go back and check!!!! I am Mindful right now that I greatly increased Mindfulness of my eating plan…by reminding myself of my goal (stability in eating, weight management, not get fat again! ), counting calories all day so I’m not engaging in mindless eating and CALORIE SHOCK at the end of the day when entering data in the Excel file, controlled portions and food selection (toting certain foods to work and not toting others…and choosing how much to bring, deciding what I’d eat when I got home, eating a little something before I leave work so I don’t go home STARVING TO DEATH…and ready to scarf everything in sight), and temptation management (telling family about my struggle and how to help…DON’T BUY FATTENING FOOD AT THE STORE…and certainly don’t bring it in and let me see it…AND me not buying fattening foods at the store…the ones that are MY favorites!) So, I went back to my early days of dieting…what I did then that worked best for me…to attempt to regain control over my eating. Another thing I considered is that my weight is low…calorie needs are lower than the early days of dieting…I may be reaching my low…and this may be as low as things naturally go…and I may need to revise MY goal to go lower…and just focus on maintaining this weight…that it may be unreasonable to push myself to lose more. So, with all this in mind…I’m TRYING to be Mindful and to approach this diet thing with Rational Mind and Wise Mind…because Emotional Mind is eating me up! Why do you think a “crash diet” 1 is an Emotional Mind behavior? We’ve all heard of these diets and most of us have done them! We see many advertised on magazine covers, “Lose 10 pounds in 10 days with the Grapefruit Diet!” Some have strict menu plans. Many limit food choices. We may be able to eat as much as we want…but ONLY lean meat and vegetables…or boiled chicken and rice all day! Consider how limited a high protein – low carbohydrate diet is. One reason these diets fail is they don’t allow us to eat our favorite foods…and WE’RE NOT GOING TO STAY ON A DIET LIKE THAT…FOR VERY LONG! Crash diets are driven by Emotional Mind because we’re WILLING to do something DESPERATE to lose weight QUICK. We’re IMPATIENT. We want IMMEDIATE RESULTS. We DON’T WANT TO WAIT to lose weight in a REASONABLE and HEALTHY way…even though WE KNOW it’s the only way to lose weight and keep it off! We’re being IRRATIONAL! We’ve deluded 2 ourselves! We’re believing a LIE. SOMEHOW WE BELIEVE THIS CRAZY DIET WILL WORK…that we’ll suddenly develop skills to control our eating…that we’ll give up most or all of our favorite foods…and just eat certain foods. REALLY, IF WE HAD ALL THIS WILLPOWER, why would we need a crazy diet? Why wouldn’t we just do a “normal diet” and eat like a slender person? They eat all kinds of things…just smaller portions! Just like other Destructive Coping Behaviors, we want IMMEDIATE RELIEF…for our long-term weight problem. So, we do something desperate to lose weight FAST! The problem with a crash diet is it’s SO UNREASONABLE and STRICT we WON’T STAY ON IT the rest of our life! When we GET OFF the diet, we return to our old eating habits. We GAIN the weight back…AND THEN SOME! That’s because we’ve been starving our body and depriving it of what it needs to function. Our brain sends out “I’M STARVING TO DEATH” signals that tell our body to PROTECT ITSELF FROM DYING. So, our metabolism 3 slows, we BURN FEWER CALORIES, and fat stores up for future famines. 4 At the same time, our BRAIN POUNDS on us to EAT MORE to replenish 5 our body. Finally, we GIVE IN TO TEMPTATION and the demands of our brain and body and we do a ROYAL PIG-OUT! Then we FEEL HORRIBLE physically and emotionally. We’re bloated, sick, disappointed, and ashamed. WE FEEL LIKE A FAILURE. Weight loss seems hopeless, so, we GIVE UP on the diet. WE GAIN ALL OUR WEIGHT BACK…AND THEN SOME! We’re willing TO TRY to defy 6 the laws of nature to lose a ton of weight fast! A friend once said, “I’ve given up on dieting. Every time I go on a diet, I end up gaining 10 pounds!” After we starve ourselves, our brain pushes us to gain extra weight so our body is prepared for the next famine! Rational Mind would encourage us to EAT THINGS WE LIKE, BUT LESS! Then our stomach will shrink and we’ll REDUCE CALORIES. We’ll get in the HABIT of eating “SKINNY PERSON PORTIONS” 7 and we’ll lose weight. Because we’re still getting our favorite foods, we’re less likely to get tired of this “eating plan!” It’ll become A WAY OF LIFE…that we can LIVE WITH for the rest of our life. We’ll STAY ON IT, LOSE WEIGHT, and KEEP IT OFF! We’ve all heard THE BEST WAY to lose weight is to do it SLOWLY! If we’re not in a major weight gain cycle 8 and we cut our food intake by one-fourth, we may lose 2-3 pounds a month. That’s 24-36 pounds a year and 48-72 in two years! If we cut our intake in half, we may lose 4-5 pounds a month or 48-60 a year and 96-120 in two years! That’s a lot…and we can KEEP IT OFF if we KEEP IT UP! A “three-fourths” or “halves” diet will serve us MUCH BETTER over time than a “crash n’ burn” diet! I’d rather lose 25 pounds a year by eating reasonably than gaining 10 pounds with a crash diet! 1. A crash diet is very strict and is designed for FAST weight loss. 2. Deluded – (duh-lew-did) – talked ourselves or others into believing something that’s not true. 3. Metabolism – (met-tab-oh-liz-em) – the process of breaking down the food we eat. 4. Famines – (fah-men’s) – times when there’s little or no food in a country or region. 5. Replenish – (ree-plin-ish) – to restore and fill back up! 6. Defy – (dee-fi) – to go against or to challenge. 7. Ever notice how skinny people eat? They eat many of the same foods as an overweight person…just smaller portions. We had a store and I’d go there after my hospital job. I was always shocked to find half a bag of chips or half a candy bar left on the desk. I could never understand why the employee didn’t eat it ALL! Obviously, their eating habits were very different from mine! They’d eat half when I’d eat two! 8. If we‘re on a major weight gain cycle, we’ll have to cut down even more to get our daily calories in the range for losing weight. These numbers are estimates based on someone who’s maintaining their weight or is only gaining a few pounds a year.